Whether you're looking for a sedan with a louder bark, a bigger bite or both, the Dodge Charger might quicken your pulse before you ever turn the key. The fact that underneath the Charger is a practical family sedan shouldn't spoil your fun. 2007 Dodge charger a 2018 starter car. 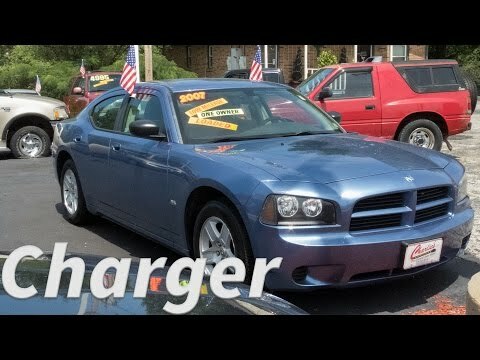 The 2007 Dodge charger is a fine vehicle. It's made in America so the availability of parts is there and most repair shops have worked with one before. The vehicle looks nice and looks even better in the rain. Its performance is good with a v6 engine it can certain go fast. Maybe not as fast as you would like but fast enough. It is a bigger vehicle so you need to be aware of that. It has smooth handling and a nice look for the interior. Custom gauges look nice in it, although mine glows green which I don't like. So far no issues with breakdowns or anything breaking. It is not as fuel efficient as some cars and I do find myself having to fill up at least once a week. I love my car and I really haven't had any problems only for the recall on the air bag, so if you decide to purchase or lease a Dodge charger make sure to ask about the air bags. Also this car is fast. You have to lightly press the gas because the take off is unreal. This car is very reliable because the motor in this car is powerful and I have had this car for a year and I haven't had any work done. The inside of my car is so spacious and you can customize it the way you want and it also has set warmers and my car model is a base model so I do not have features such as Bluetooth. The purple beast. Why I love my husband's Charger. My husband and I currently own a 2007 Dodge Charger srt in a limited edition plum crazy purple. It was bought brand new and has performed consistently throughout the years. The only issue I personally have with driving the car is the fact that the gas mileage is much less for day to day driving vs driving on the freeway. Other than that I love driving such a powerful vehicle. We frequently get a lot of attention because of the color and condition of the car because it looks brand new.